Jurij Kobe is one of the most visible Slovene architects of today, part of the generation that formed around the magazine Arhitektov bilten AB (Architect’s Bulletin AB) towards the end of the 1970’s. 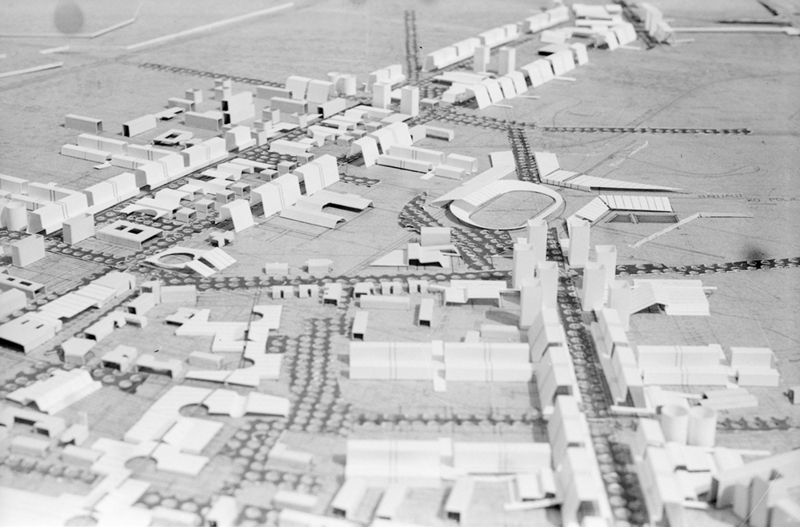 A brief outline of his architectural oeuvre shows that it comprises mainly school projects, from primary schools to faculty buildings, and the arranging of exterior open spaces, as well as bridges. Jurij Kobe is certainly amongst the most prolific Slovene architects, with more than 50 realised works in his opus, of which many have been critically recognised and lauded. For many years he has been a member of the organisational committee for Piran Days of Architecture, which takes place every November in Piran. 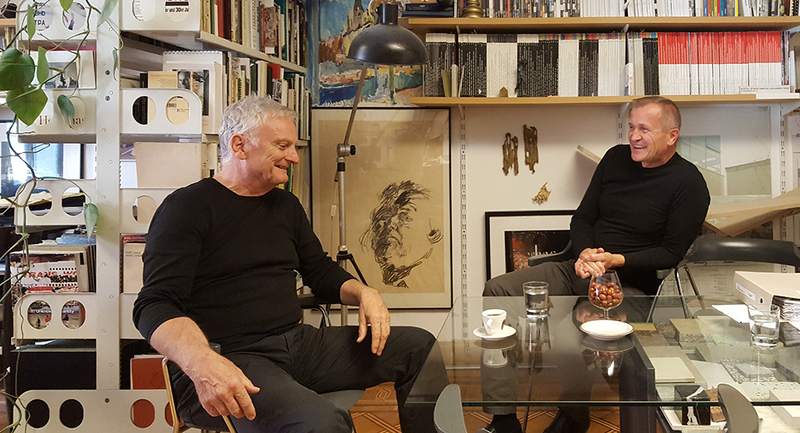 This is why the first part of the interview is dedicated to Piran Days of Architecture that in 2017 will be organised for the 35th year in a row, and to our colleague and our friend Vojteh Ravnikar, who was one of the founders of this event. In the continuation of the interview we are going to focus on Kobe’s work, and his attitude towards architectural issues, space, and so on. Jurij Kobe and Robert Potokar during the interview at office in Mestni trg, Ljubljana, 10 October 2017. Ever since its beginnings you were in the organisational committee of the event called Piran Days of Architecture (PIDA). How do you remember its establishment, and how did it develop over the last 35 years? It actually started with the promotional exhibition of the architecture of the Karst Group (Skupina Kras), the protagonists of which were Vojteh Ravnikar, Matjaž Garzarolli, Marko Dekleva and Egon Vatovec. A number of architects from some other not-so-distant countries also came to the opening of the exhibition. This is how this yearly Piran trip was born –with an invitation to a small circle of architects, actually at first just with the Trieste-based architects Gigetta Tamaro, Luciano Semerani, Marko Pozzetto, and Boris (Podrecca), who helped a lot with it, then there was, of course, Branko Silađin from Zagreb, with whom we became closer through the events organised by AB magazine. Very soon Francesco Dal Co also became one of the permanent members of our circle; he helped extend it first in the Alpine-Adriatic region, and later on it spread throughout Europe. To my mind the Piran Days thus became an exceptionally important European architectural gathering, one that was growing but still remained profiled and focused. We have always selected lecturers according to the trends we wanted to emphasise. At the time these architects were not yet so well known, but it’s interesting that many of them later became real stars. A relatively unknown Alvaro Siza came to Piran, then Souto de Moura, Luigi Snozzi with his Mendrisio school of architecture, similarly Sverre Fehn with an emotional explanation of his small project in terms of dimensions, and many others in this category … whom I would not want to call “old architects” (I don’t like this term! ), even though many of them are at the peak of their careers… Actually, all the top theoreticians lined up in Piran, from Achleitner to Frampton and Curtis … This is how the circle of those who helped us pick lecturers expanded. Of course, there were ups and downs, but despite these the Piran Days remained in their profiled network, which in my opinion is what counts most. And it is quite encouraging to see this event flourish again under new leadership. I am most pleased about the fact that more and more young people are coming again. When looking at the Piran Day’s mission, I see that the event has had some very important children! Even Andrija Rusan said to me that there would’ve been no Days of Oris if it hadn’t been for Piran before that. This is quite a recognition – from someone who manages to attract 2,500 visitors to his event in Zagreb compared to 250 participants in Piran. Well, there’s also Piranesi, a magazine that can boast certain publications, reviews and retrospectives that our other magazines don’t get. And I must say that you’re successfully continuing it after Vojteh’s departure! What does PIDA mean to you today? 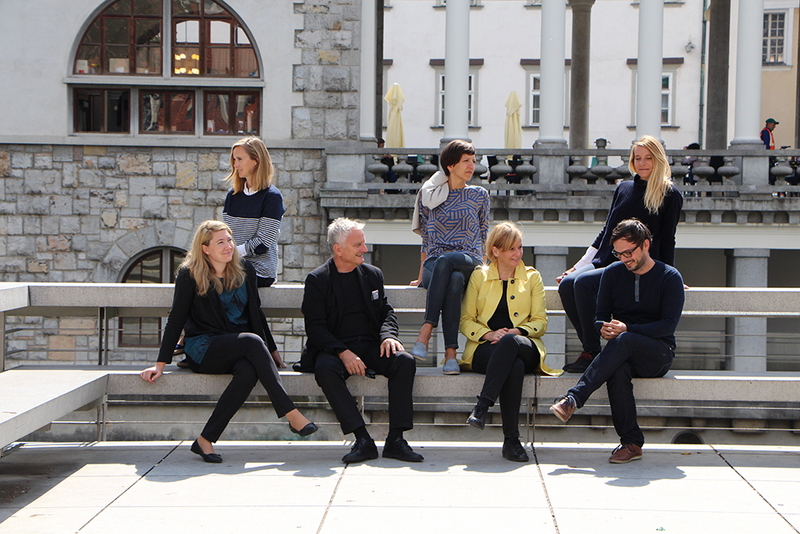 Can you say something more about your relationship with Piran, with fellow architects you met there? Certainly, beautiful links are created at these annual gatherings; with some of them we later worked on competitions together, with others on exhibitions, and connections are also created between universities … all this is priceless. You worked with Vojteh Ravnikar at Piran Days, and even before that you knew each other a long time. When did you first meet and later on cooperate in different areas? When I was a sophomore, Matjaž Garzarolli brought me to Vojteh’s home and all of a sudden we were already drawing competitions for him and Katjuša Mayer. We really learned about architecture there too. But this was also friendship, growing in all possible directions, from parties and jazz, to trips and joint winter and summer holidays. Later on, we started working together as equals. A few competitions were created where I was no longer merely the one drawing, but rather an equal associate. If I am not mistaken, you and Matjaž (Aco) Garzarolli bought a Citroen 2CV (after winning an award at a Yugoslav competition, and together with Vojteh you drove off on a three-month journey to India. That must have been an interesting experience. Can you share an interesting story from that journey with us? Well, it was quite interesting that we met our Nepalese colleague at his home in Nepal, who, as a matter of fact, was back there for the first time since he had left to study in Ljubljana! His brother-in-law was the Nepalese forestry minister, and this is why we were allowed to sleep over at the government lodge at a pass between India and Nepal, and early in the morning when it was still dark we had a beautiful view of the sun-lit Himalayas. You completed your studies at the Faculty of Architecture in 1973. What was the topic of your Diploma Thesis with Professor Edvard Ravnikar? What was your relationship like? For my thesis, however, I chose the topic of “public transport in Ljubljana,” and compiled some 80 pages of text, but when I finished it all of a sudden I gave up. Then I typed eight pages listing my misgivings on my thesis, and read them in front of the jury. “The old guy” took it stoically and I got the highest mark possible. Because of the atmosphere I described above, only one student from our core group at the seminar graduated from “architectural design”: he made a design for a prison which at that time was rather unusual. Other theses were more in the field of deliberations and research. The first joint works came at the beginning of your career with colleague Aleš Vodopivec. That was the third meeting that was very important for me. 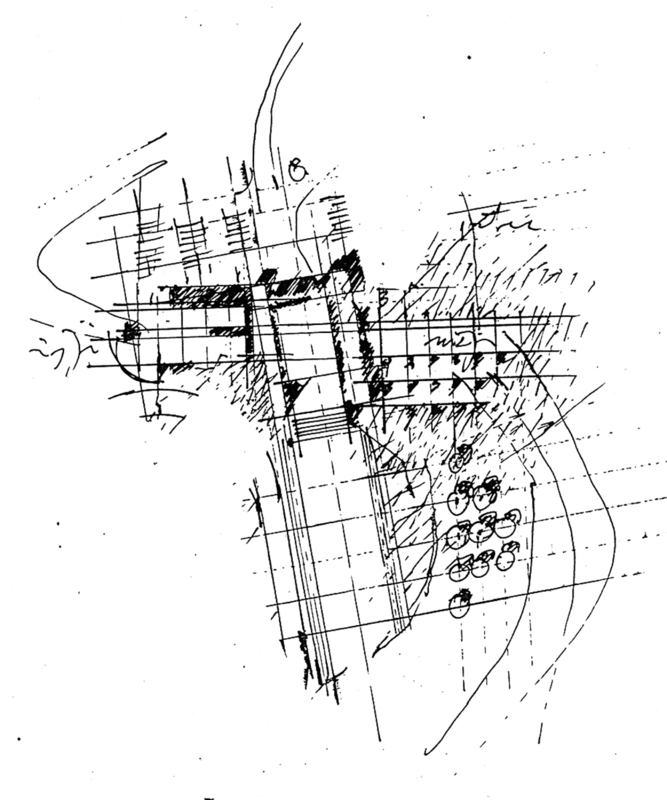 The period of seeking a broader foundation of architecture. This is how we ended up studying philosophy together. 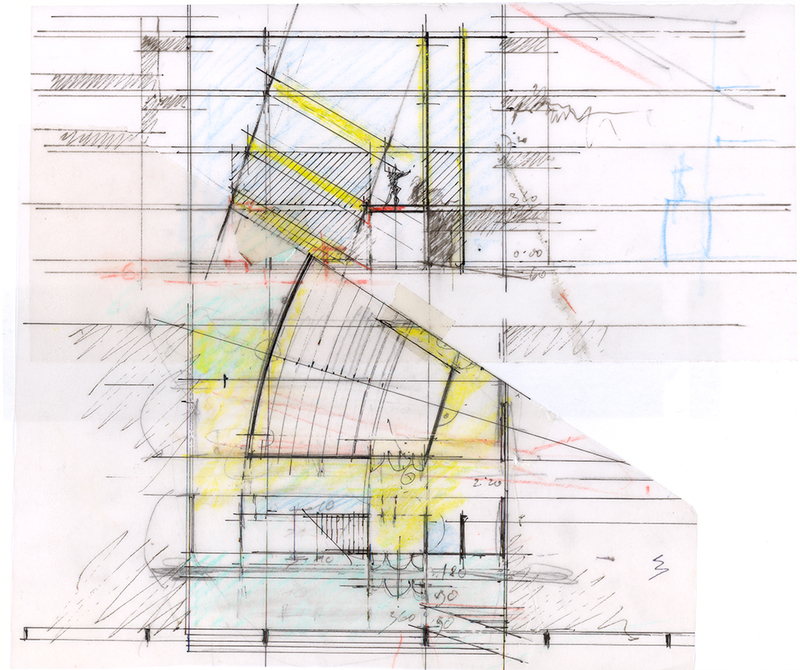 This was the time of expressly discursive thinking about architecture, and if I can paraphrase Wittgenstein: what I cannot express or defend, cannot go into architecture … For me that was a big step. At that time – with a similar direction – the AB started for us. It is with Aleš that we took over “the keys to the editorial office” on behalf of a wider group from the previous generation. AB, of course, meant more than a magazine. 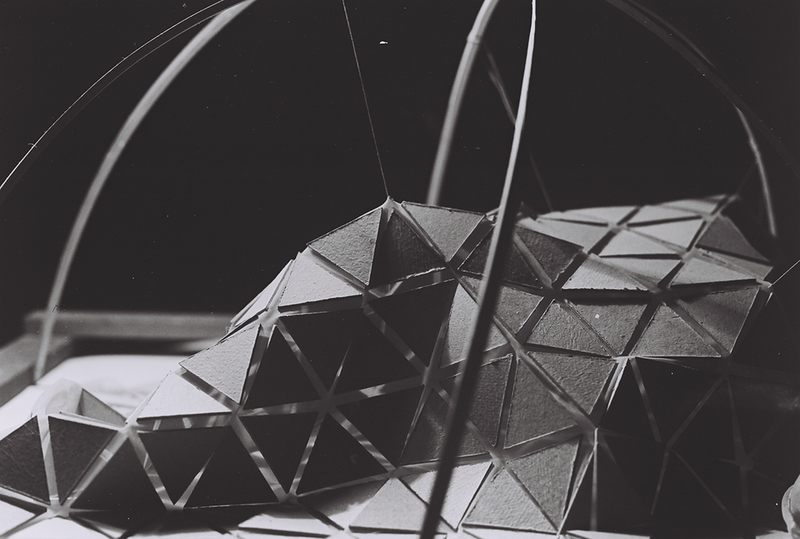 These were gatherings on a Yugoslav scale, lectures with guests from abroad (Tafuri, Radović, and the like), exhibitions (characteristically) entitled Architecture and Word, Violence and Architecture, and so on. And of course, socialising in all forms! This is where the bridge to the Piran Days and the Piranesi magazine started to be built! 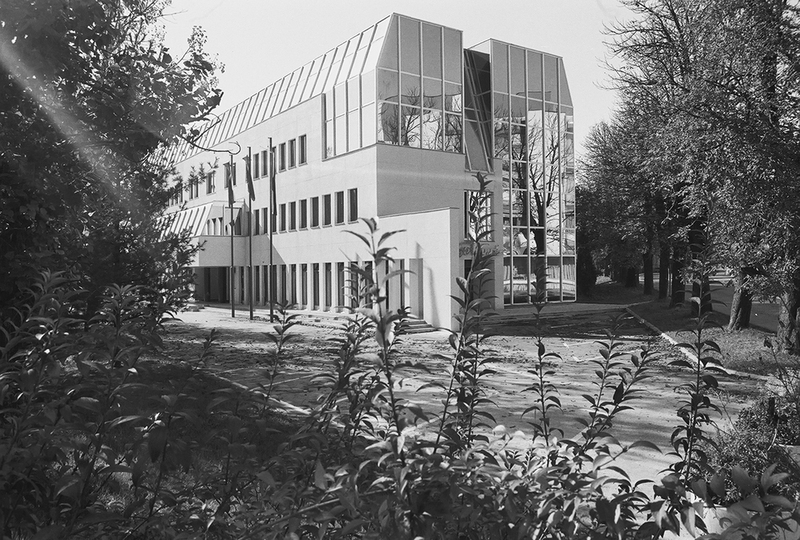 You worked together on a number of projects, competitions … The story of the competition for the administrative building in Novo Mesto is an example of what can happen with a competition design at a later stage. Well, they were already available at the time, but inappropriate materials were used. We even required a declaration that we didn’t agree with that façade. I don’t see the point talking about that now, the building is not there anymore anyway, but this might have saved us from a possible lawsuit, so I still keep that document safe. However, we were luckier with the realisation of the Bogatin in Bled. 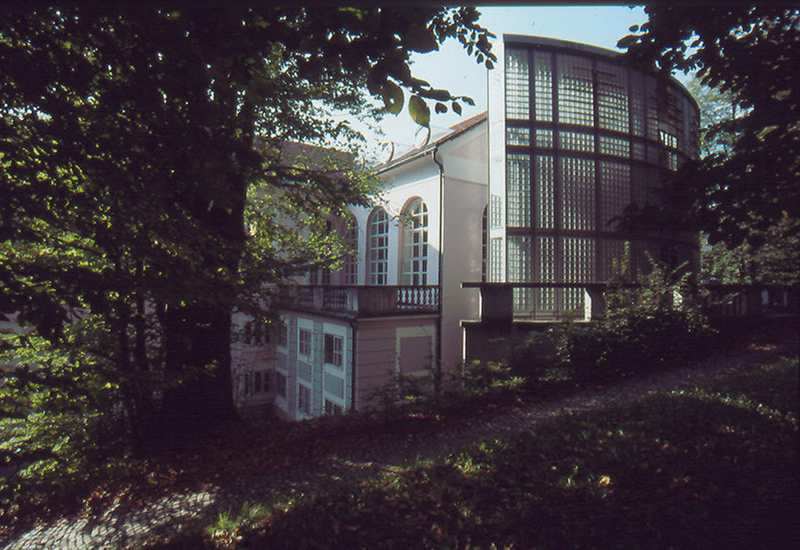 One of your larger independent projects was the renovation of Cekin Mansion in Ljubljana, with the addition at the back, with glass prisms. Cekin Mansion was very important to me. It is then that I first encountered precious heritage that one is a bit afraid of, which I find important for every architect. The project design met with mixed reactions: some welcomed it, some less so. Perhaps it was a little rough in places, but today I wouldn’t have done it much differently. 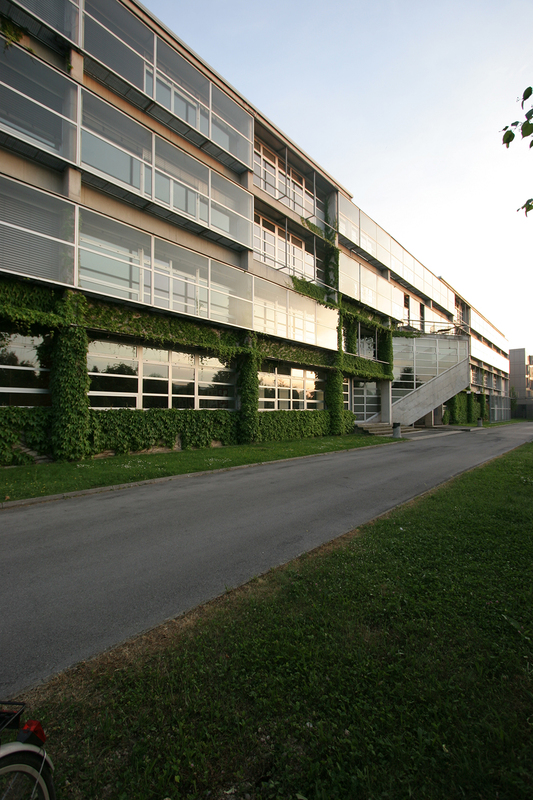 The Biotechnical Faculty, set in the green environments under the Rožnik Hill, is perhaps a somewhat different type of school building. 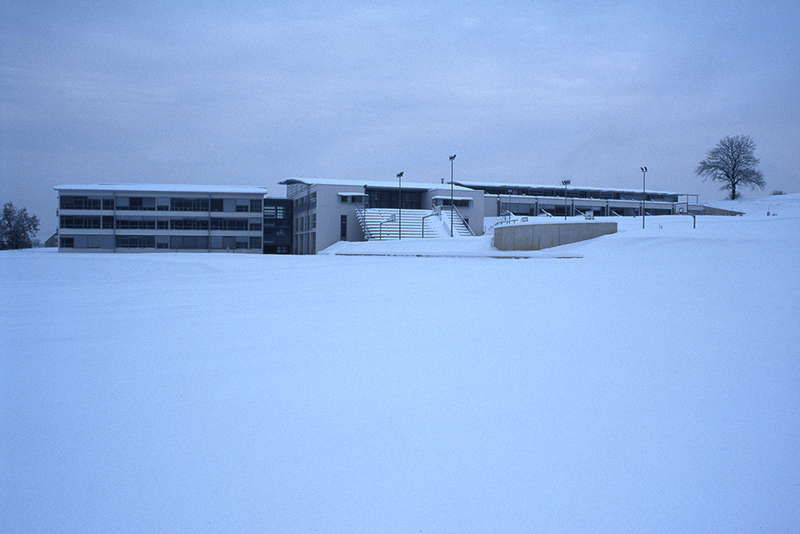 The competition was in 1980, and the implementation in 1985, in the time of Post-Modernism. 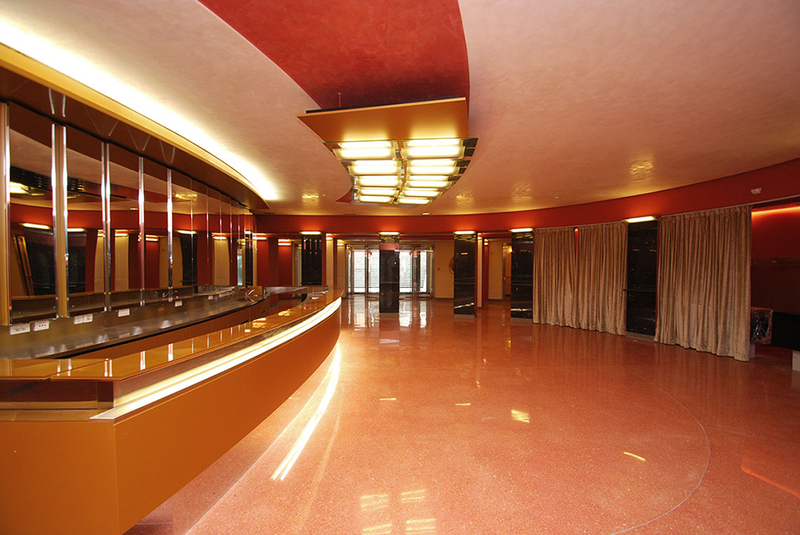 Yes, that was a time when Post-Modernism was very strong in Slovenia. 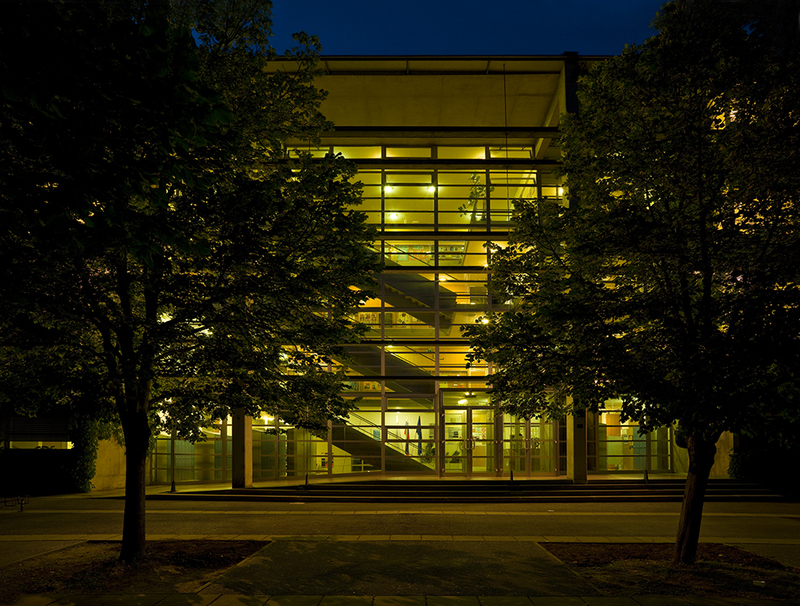 The structuralist orientation was very important to me, the building is very much broken down in different links. 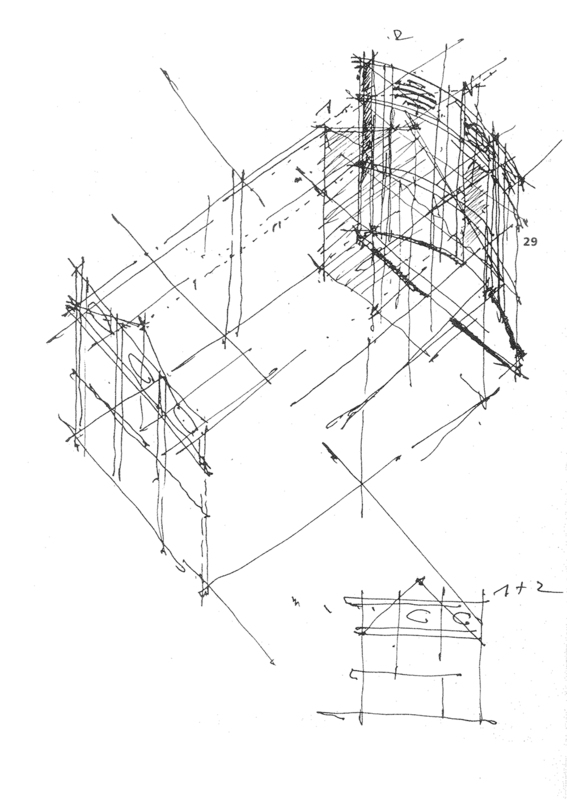 As an aside: I have always been interested in Russian architects from the beginning of the 20th century, the post-revolutionary period, and the structural view of composing space. One of the first books I bought was the translation of Miljutin: Sotsgorod, the Problem of Building Socialist Cities, which was already available in Slovenia in 1974. Can you say something on the question of arranging public space? 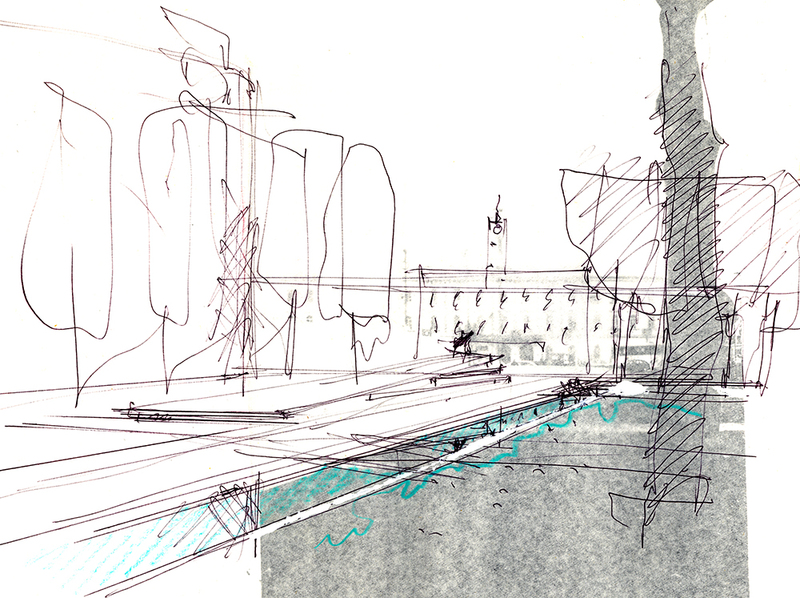 The thought of the design as an object, exterior space, also linked with bridges. I have never differentiated between the open and closed spaces. Architecture is about building and designing space. Hence my reservations towards excessively “sustainable design.” If I have decided to do something, it is only right that it is seen, and I dare say this out loud and admit it to myself. I wouldn’t dare try emulating God the Creator! We are still dealing a lot with exterior spaces, and for me this is quite important. This also shapes the soul and how someone feels, much like if you go into the interior and you experience it in the closed space. I have to highlight another area of your planning – bridges, where you not only upgrade the construction aspect, but are also trying to introduce symbolic and artistic meanings to the crossing of the river. 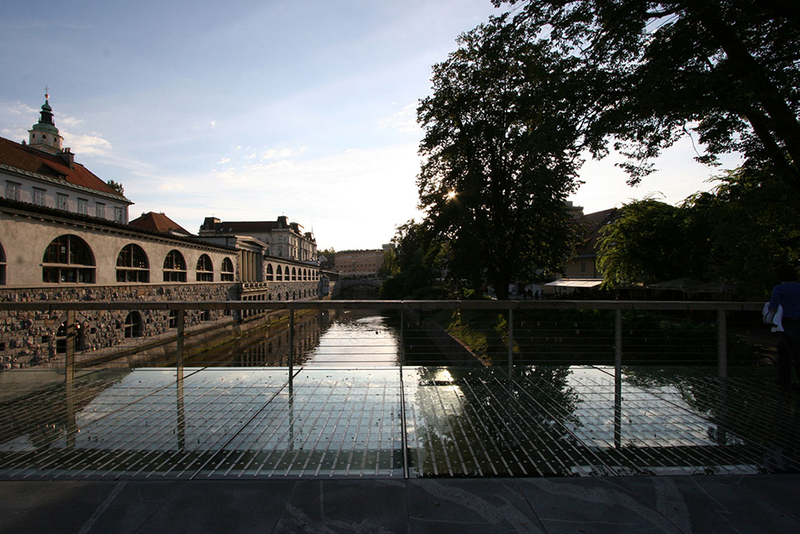 Let’s take the Barje Bridge and the arrangement of the banks of the Gradaščica, and the new Mortuary Bridge, in Ljubljana. Every bridge has its own story. 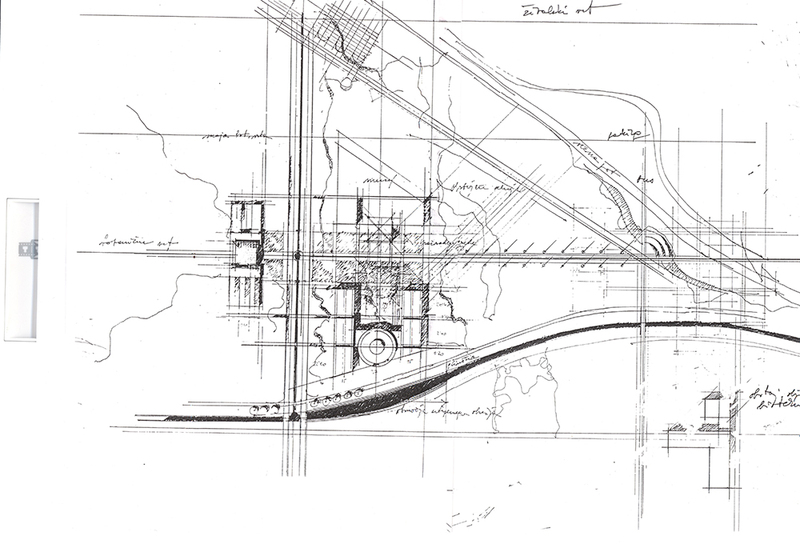 The Barje Bridge was traumatic because the span was already outlined when I got hold of it, and I could only design the cross section. The dimensions of the park it crosses, however, are much larger! This is why the wing walls are pulled so far in an exaggerated way. In this way the entire bridge was somehow given the appropriate length, and signs were added telling that this one is entering the city core. The Hradecky Bridge also has lampposts, but they come from another story: Plečnik put cones with lamps to the first transposition of this bridge. The new lampposts represent a sort of a homage to the architect. 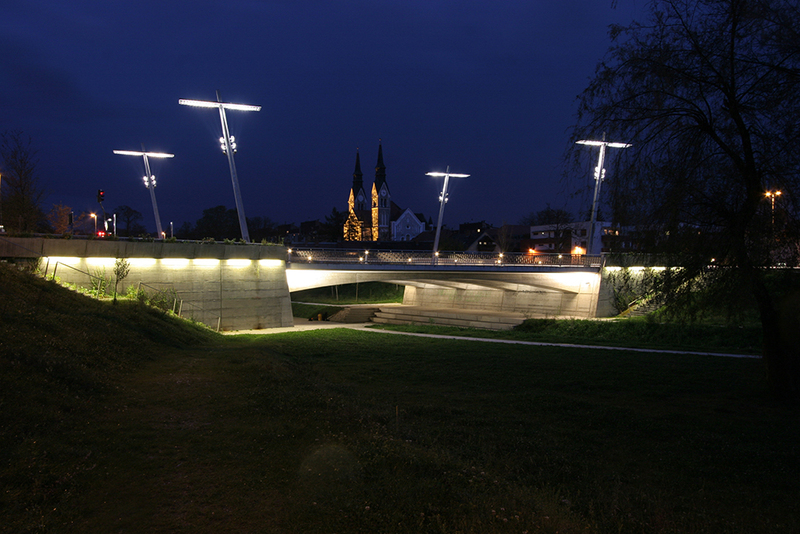 We successfully developed them in Hrastnik, where we tested how these hoops will illuminate downwards without polluting the sky. Please, tell us more about Butcher’s Bridge and the relationship with Plečnik’s unfinished project? 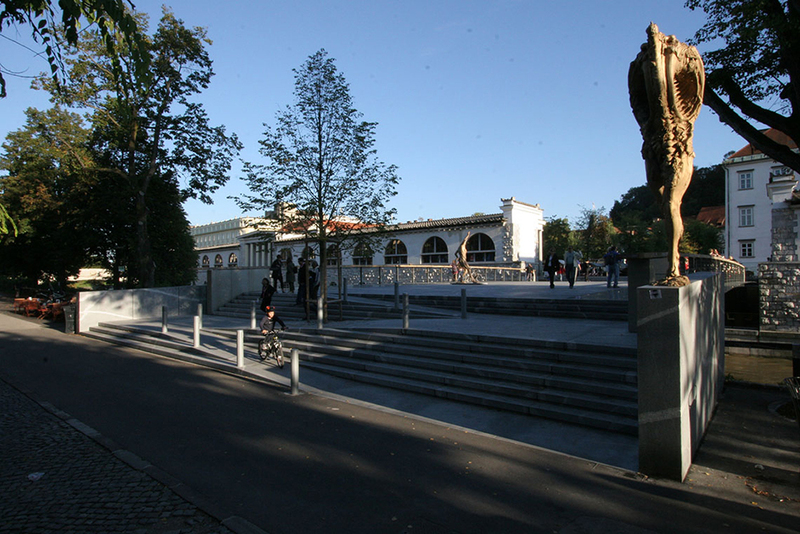 On the debate that developed in the newspapers, as well as the cooperation with the sculptor Jakov Brdar; the bridge was upgraded with his sculptures. Butcher’s Bridge had quite a success, and video spots are still being shot there to show it off. Still, I feel somewhat conflicted about this, a dual attitude: the competition required that the bridge be minimalist, that we not intervene into Plečnik’s work and not curtail or obstruct the views from the Dragon Bridge to the Triple Bridge, and vice versa. And I still believe that this was achieved in a good and innovative manner. 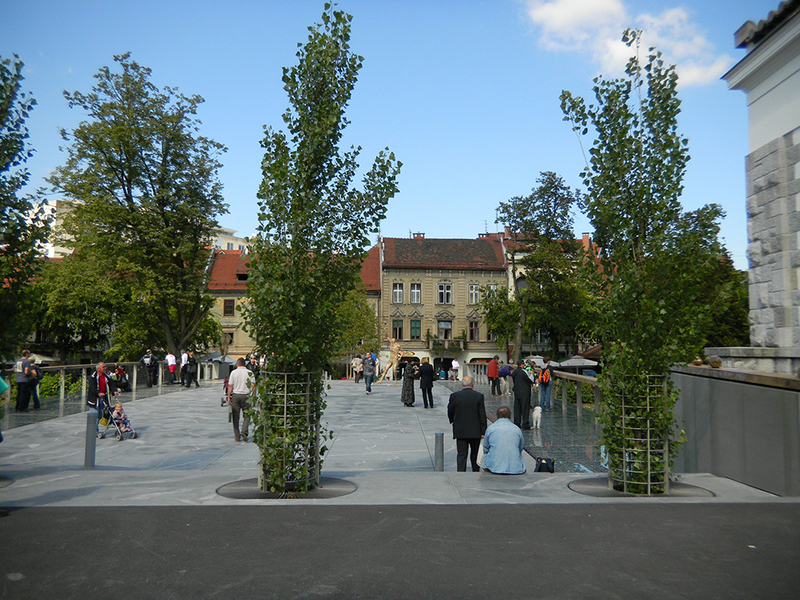 We tried to solve the problem of the missing volume as compared to Plečnik’s work with the use of poplars, which we planted (as Plečnik did, too) into the gap between the market colonnades. The volume was also accentuated with Jakov Brdar’s sculptures, with whom I had already cooperated on the project for the Biotechnical Faculty. (This can be seen in the sculptures of Flora and Faun which round out the pillars in the hall that spans three floors.) 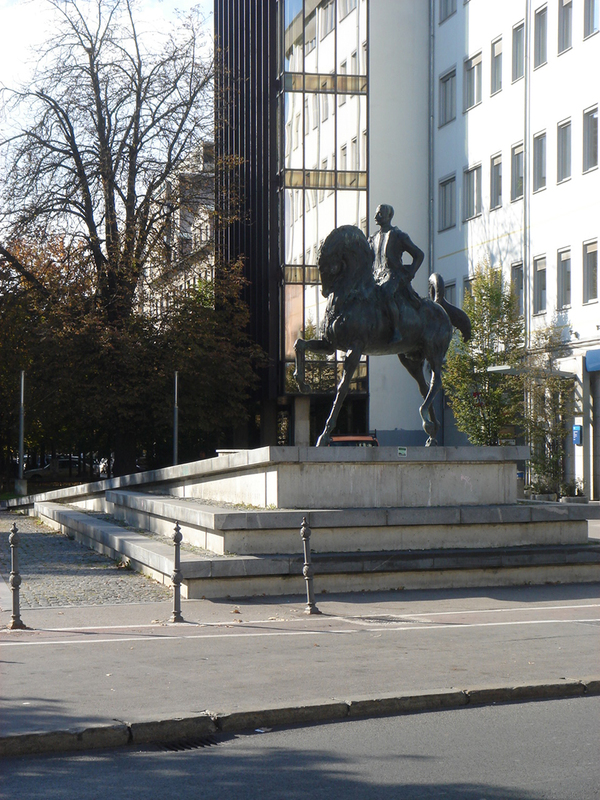 We also cooperated in the competition, and then with the realisation of the monument to Rudolf Maister. 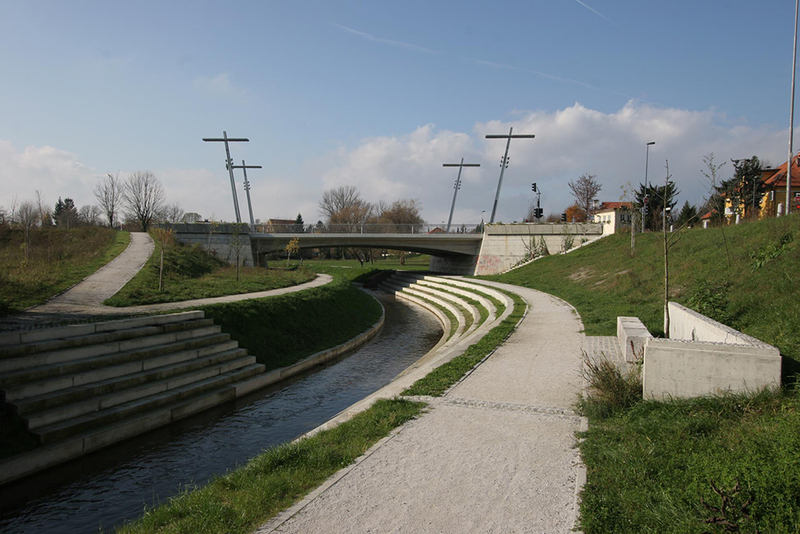 But, interestingly enough, more than 20 years ago we cooperated with Aleš (Vodopivec) in the competition for the market and this same Butcher’s Bridge, and were the only ones to suggest Plečnik’s bridge according to its original concept. Another topic that you often deal with is school buildings. 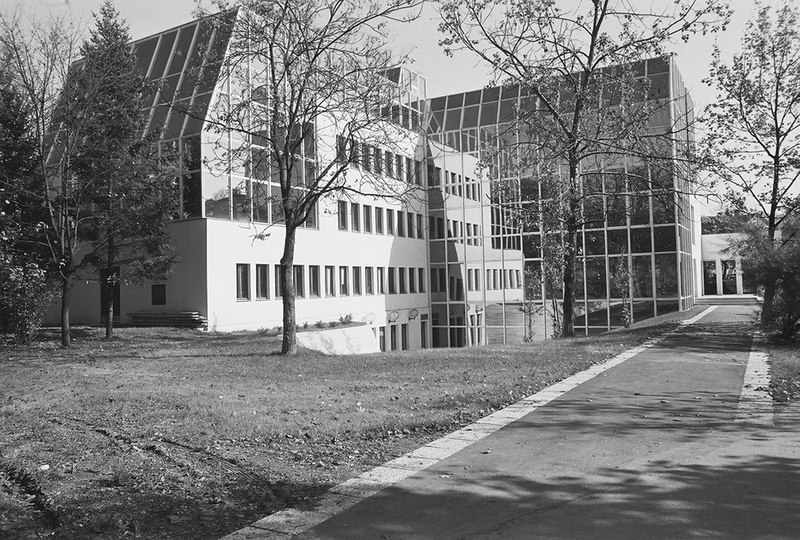 In your oeuvre there are probably more than 20 such buildings, from the Primary School Šmarje Sap, the Primary School Drska in Novo Mesto, to Secondary School of Nursing in Ljubljana. Are these a coincidence or rather a deliberate focus of your work? I’d say that more than 20 is probably an exaggeration. 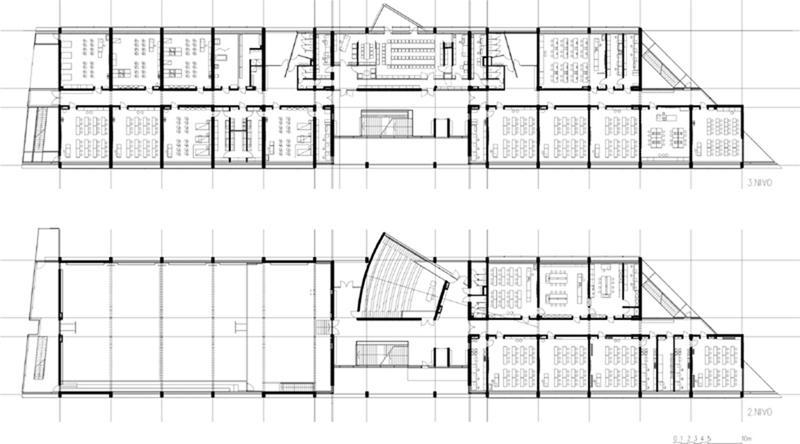 But also that a positive, optimistic charge is intrinsic to school architecture. Architecture speaks a non-verbal language, and I believe that in the case of a school building it must address a young, unspoilt, or perhaps better said, an unburdened person to a greater extent than other projects. I was very pleased about the school in Šmarje. 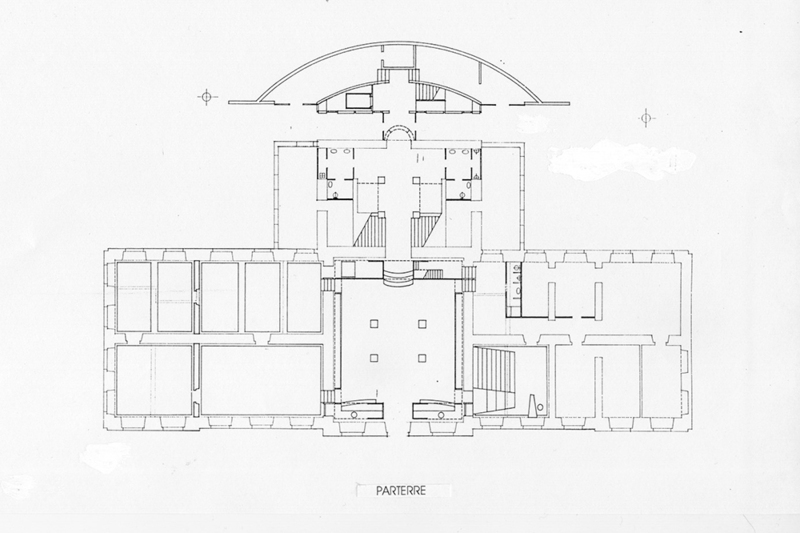 In this project I learned from the architect (Emil Navinšek), who designed this structure very modestly, with a minimal hall, compared to the scale of his later projects. Nevertheless, the concept allowed for, or led me to, the extended addition. The harder part was on the other side of the old building: a gym was added later in front of the entrance, and how to create a decent composition out of this!? The picture today, however, is even more disastrous! But these are the signs of the time, of today! I am also very much attached to the Drska school in Novo Mesto. 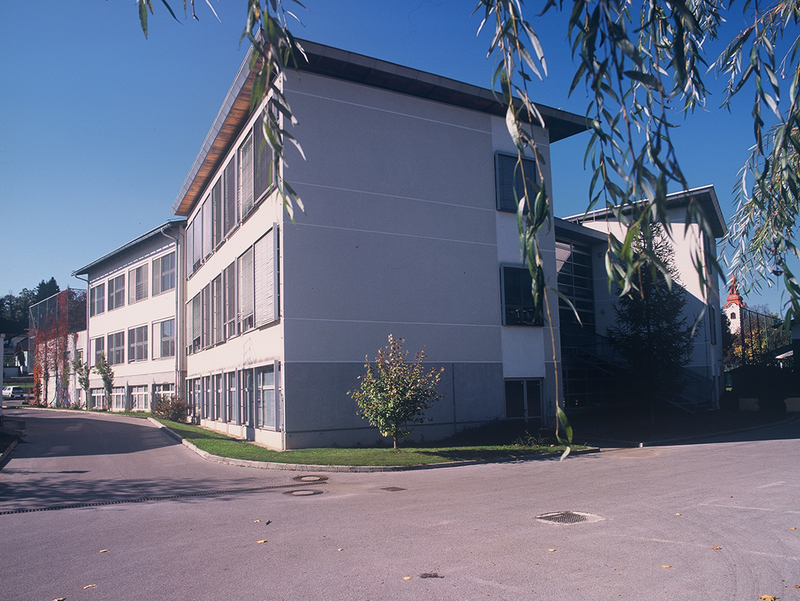 The basic plan is the same as that of the Biotechnical Faculty and the Secondary School of Nursing: a common space in the middle with wings on either side, intended for individual work. This school opened its wings so as to stop the urbanism from penetrating into the beautiful valley to which it is oriented. And it seems to me that it stands right and functions appropriately. I’ve also heard that the users are still happy with it, which is no a small thing. 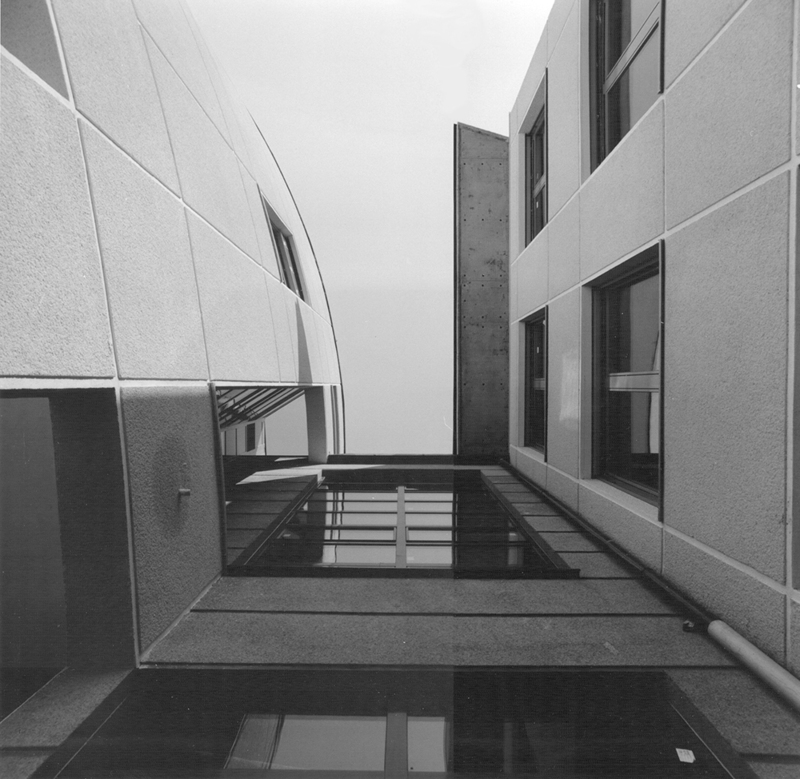 In general, the Secondary School of Nursing is a piece of architecture that co-creates the exterior and interior school space. You’ve received the majority of your awards for this project, and understandably so, amongst which we should note the Plečnik Award in 1999 and a nomination for the Mies van der Rohe award. As always, the exterior space is equally important as the interior. The school is positioned as it is for urban planning reasons: along the park already planted with 88 trees it makes a road space, and as much space as possible is left for the playground, which is one of the most important centres of the school. It was really a traumatic experience to study the regulations on the allowed surface area of common spaces. This is why we put maximum effort in the design of the vertical hall: I “stole” some of the external space that is not included in the surface area, but we do mentally perceive it. One can thus feel the entire volume of space by the vertical axis looking through glass, and so see the space of the school garden through it. In architecture I also find it’s important to read what is between the lines. This is a parallel narrative that’s not merely a form for form’s sake, as I am not interested in that much. 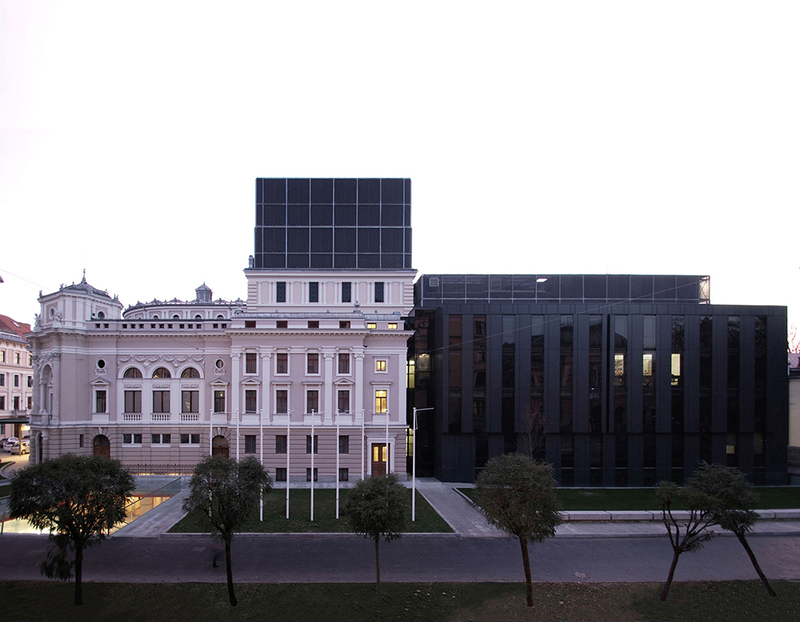 Overall, I’m pleased that I succeeded in including a lot of the Ljubljana architectural school into this building. 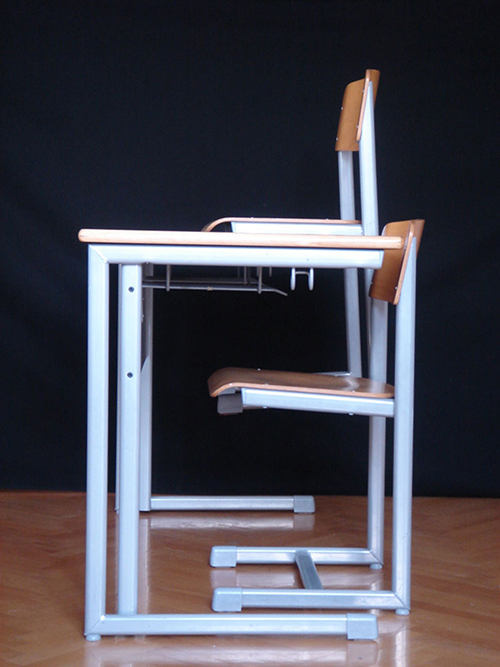 The chairs in this school were already designed for the Šmarje school but were not used there. What should a school chair be like? Such that sitting and writing on it is comfortable, that it allows enough leg space, and that it is easy to sweep the classroom too. 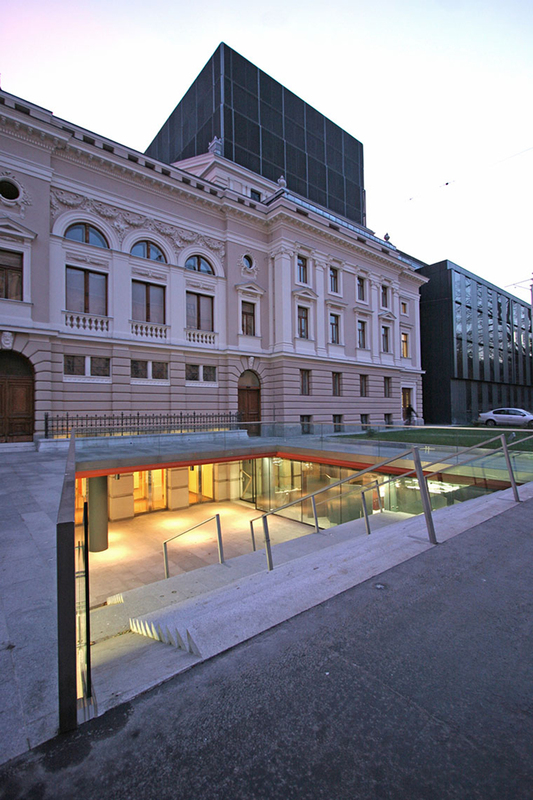 The renovation of the Opera House in Ljubljana was also a project that attracted a lot of attention. Together with Marjan Zupanc and associates you won the competition in 1998, and then it took a while before it was implemented. The interior organisation is high-tech indeed, and this is what you also wanted to indicate on the façade of the annex. A black cube reflecting the surroundings, but what does having a cube above the existing tower actually mean? 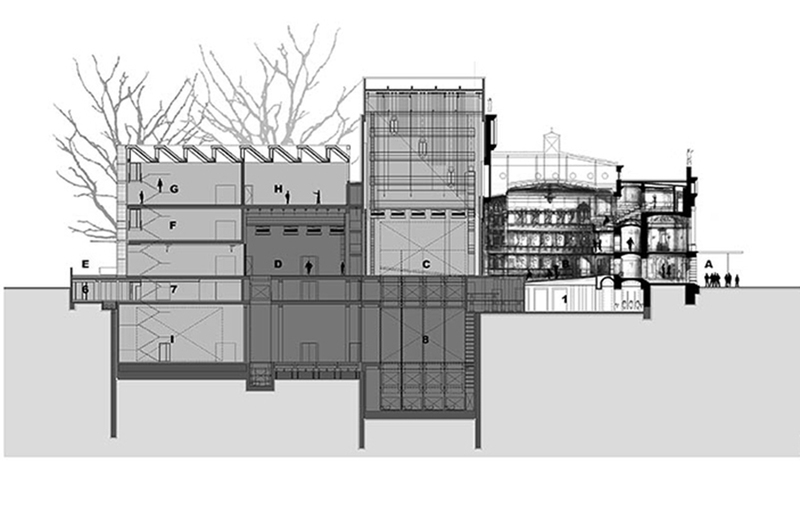 This is a continuous process in architecture. You start with complicated forms that you clean and clean later on, and gradually you come to the simplest form possible. 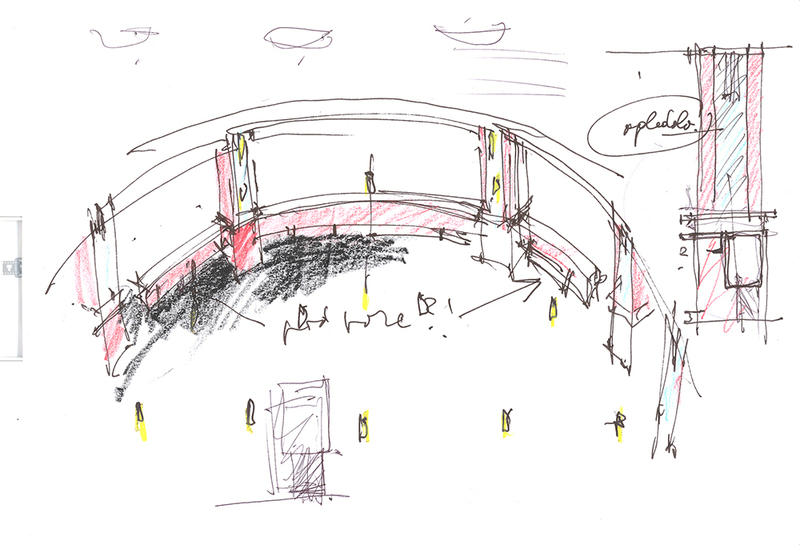 It was the same with the thinking process when we were trying to find a solution as to how the machinery needed for the stage could be outwardly expressed. Therefore, we decided to take a dual approach to design: on the one hand, placing such technology in a rational box, at the back and on top, followed by a gentler adaptation to the old house that is outwardly only visible at the bottom. The old symmetric house is addressed in a symmetric way, with atriums that lead into the new foyer; this also increases the city parterre. It is again important to work on the house both from the outside and inside. 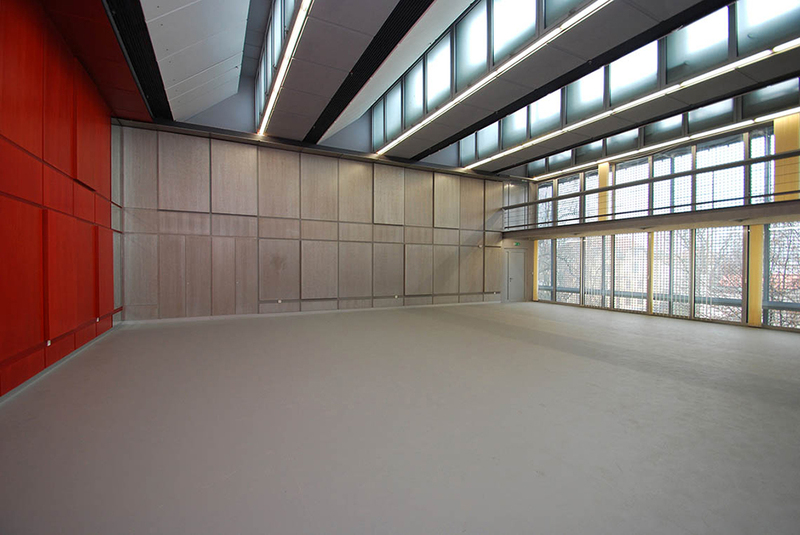 With small interventions in the interior the volume is increased to the largest possible extent – and thus partition walls between loggias were removed. Even things that you don’t actually notice: stairs that lead into the basement or the new foyer. They seem as if they were there already in the original plan. 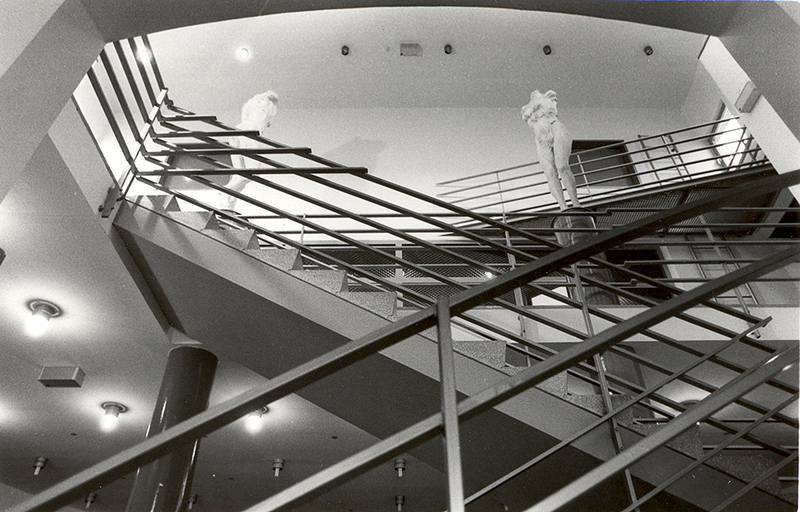 But the truth is that we found a way to prolong the stairs within the geometry of the original ones. Having said that, I was especially pleased because some time ago I worked on four scenes in the Opera. For me this was an excellent parallel project, and in a way we’ve made a casing to our previous work. 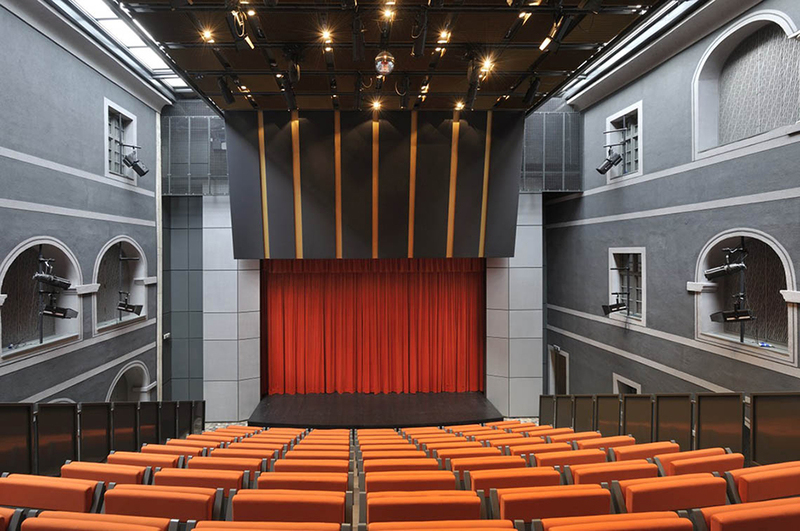 One of your latest projects was the renovation of the monastery in Maribor that was turned into a puppet theatre, where together with Rok Žnidaršič and associates you successfully revived the abandoned walls to become an interactive programme, for which you received the Plečnik Award in 2012. Recently, you have also succeeded in renovating the church there, which now hosts cultural events. I was quite surprised when we won the competition. After 40 years we perhaps finally succeeded in realising, in a relatively simple way, what Garzarolli and I dreamed of: we started the competition for the cultural home in Bitola, and then had to stop as we didn’t find a solution for the hall that could expand or shrink according to our wishes and the ambience that the various types of events would require. Here we managed to do that. 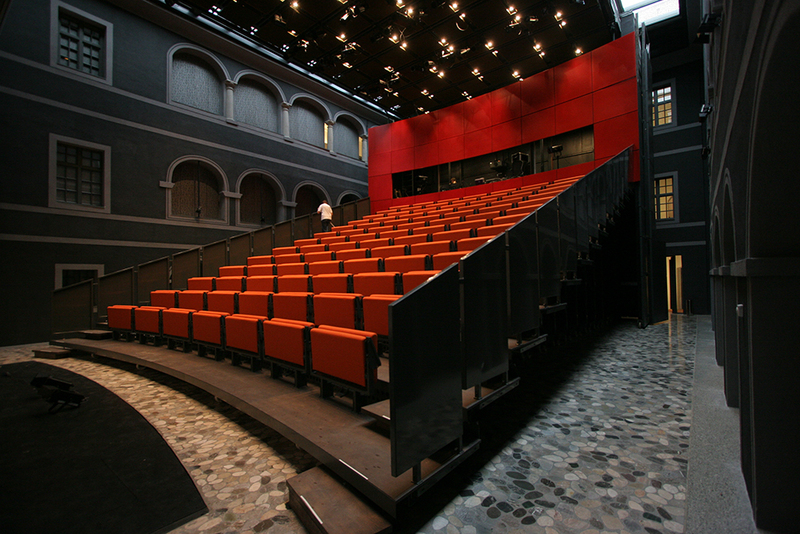 With the pull-out stands and seats that are “eaten” by a movable wall. At the same time this is also a narrative of how within one space we also created another one that moves: a pulsating story, a sort of distance that is very important in the interventions into the existing forms. 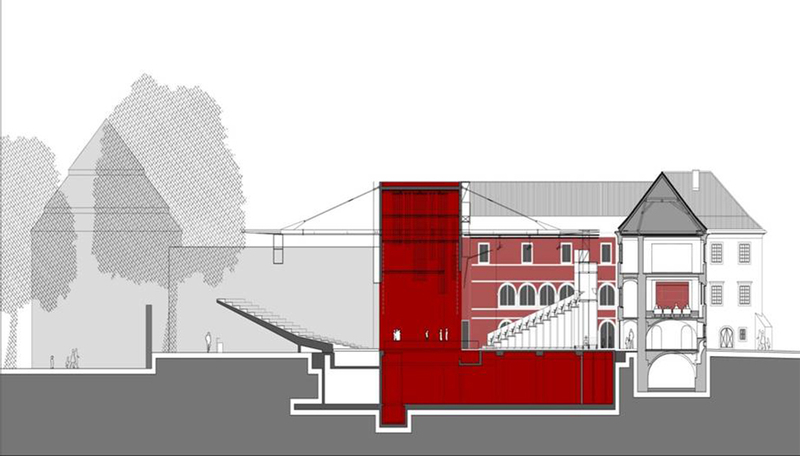 The external auditorium that was made later was already conceived for the competition, and calculated in the static concept of the stage tower. The third site is the church. 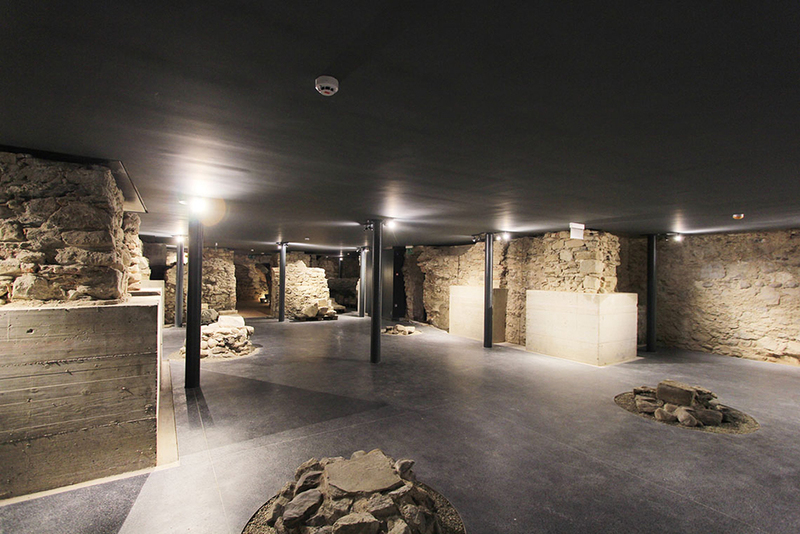 During the parallel excavations we were surprised by the discovery of a Romanesque church, uncovered five metres below the existing church flooring. 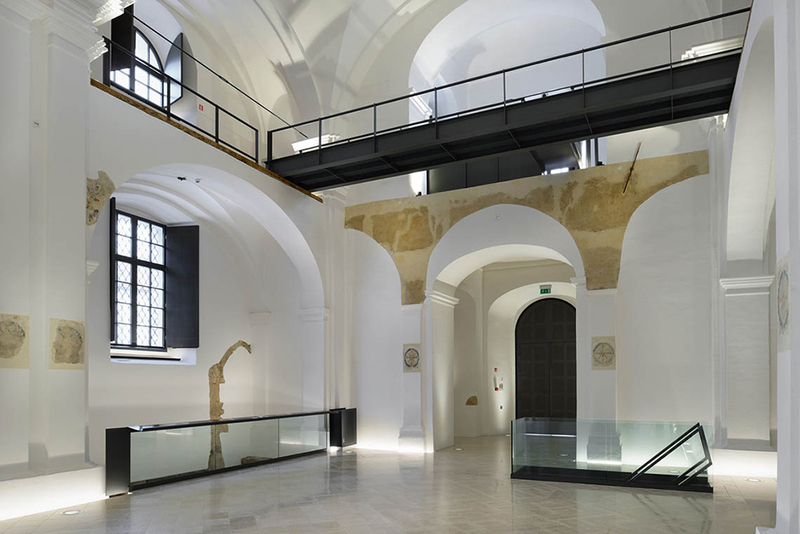 This prompted the solution that the ceiling construction between both levels – the floor of the Baroque church – should hold all the necessary equipment for heating, cooling, ventilation, and the function of shows in spatial terms. The project will be concluded with the design of the entrance square, with the entrance building and the Judgement Tower as the completion of the Minorite complex that we are dealing with. Perhaps I am already repeating myself in my questions, but still, I would like to ask you more about competitions, as you regularly take part in them, and very successfully, too. Can you remember any other competition plan that you made on your own, and which you feel is an exceptional example of your work that has never been realised? Here I have a number of skeletons in my closet, and for some I must say that I’m sorry, as far from all of them are good. A person can make a plan, a design in a short time, with less deliberation on it, and another with more luck. 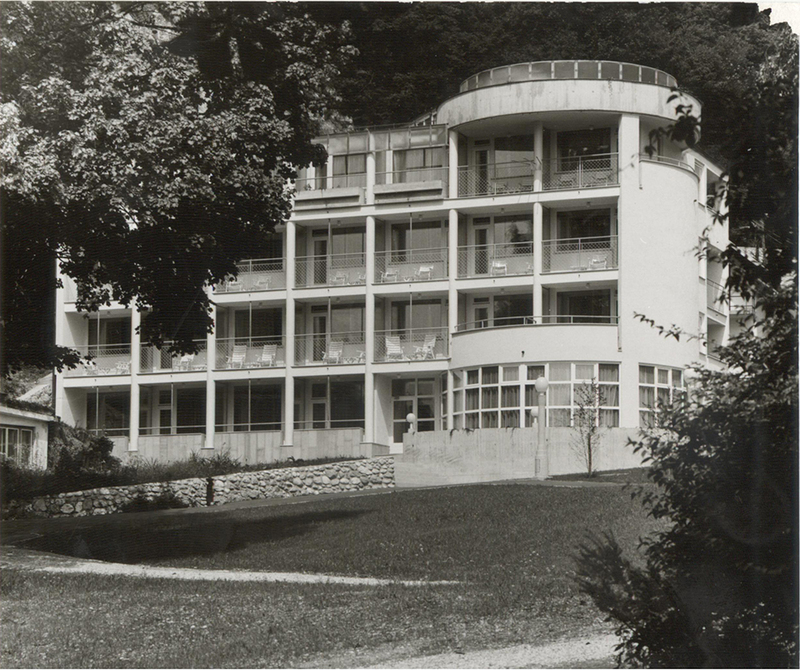 I remember the Secondary School for Catering and Tourism in Radovljica. We won, but then the project “fell asleep,” and a horrible cake-like structure was constructed there instead. Our competition design included not only the school but also the town; it was really a very extroverted building that would also function as a school. Another competition I remember was for a home for the elderly in Trnovo. We designed it really well, but we crossed one corner of the plot by half a metre and so you won it. We are also sorry about the secondary school in Slovenj Gradec and about a recent competition for the Academy of Fine Arts and Design. Different eyes see different things, of course. What do you think about the format of such competitions? I guess you believe that a competition is the best approach, as well as a democratic way of assigning projects. Of course, this is the only right path towards the selection of the right project design. I regret that the entry conditions now are very strict in terms of documentation, which to me seems to be an obstacle, it’s like shooting oneself in the foot. Why should we exclude young people without experience in realisations, as that can be later supplemented by an experienced hand? Only in this way will new and fresh things come to light. I don’t know what else I could add to that. You could add that in 2014/15 there were practically no competitions. Well, we participated in competitions in Croatia and elsewhere! So I’m not sure what you mean. All the important works of architecture that have contributed significantly to our national identity come from the period before Slovenia gained independence. What does that reflect? That we are in a time without vision. That issues are resolved as we go along. Well, at least recently some more competitions have been launched. 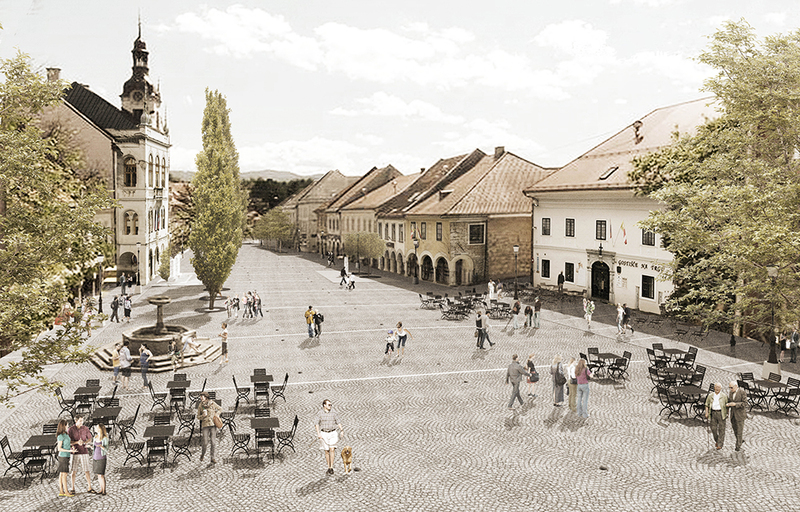 One of your latest competitions, where in fact you won the first prize, was the project design for the arrangement of the open spaces of Novo Mesto last year. Soon the solution you proposed will be realised. Yes, we are very pleased with this. They are starting with the excavations in the Main Square for archaeological research. They are going to renovate the Main Square and the blind alley, the street that used to lead to the former wooden bridge across the Krka River. As you mentioned before, in the beginning you had an office together with Aleš Vodopivec. Later on, your professional paths parted and ever since you have been mostly on your own in your office, with younger colleagues around you. I consider myself lucky, in that people joined me with whom I really like working. Many of them later started working on their own, very successfully too, of which I can be nothing but glad. These too are my children, in a way, and it’s the same as when your student from the faculty succeeds. Now we have a team we have been with for some time, and we all work well together. How do you organise work in the office? And a question related to your current work. What interesting things are there on your table, as I know that you don’t use a computer to plan designs? A sketch is probably still your first means of expression. 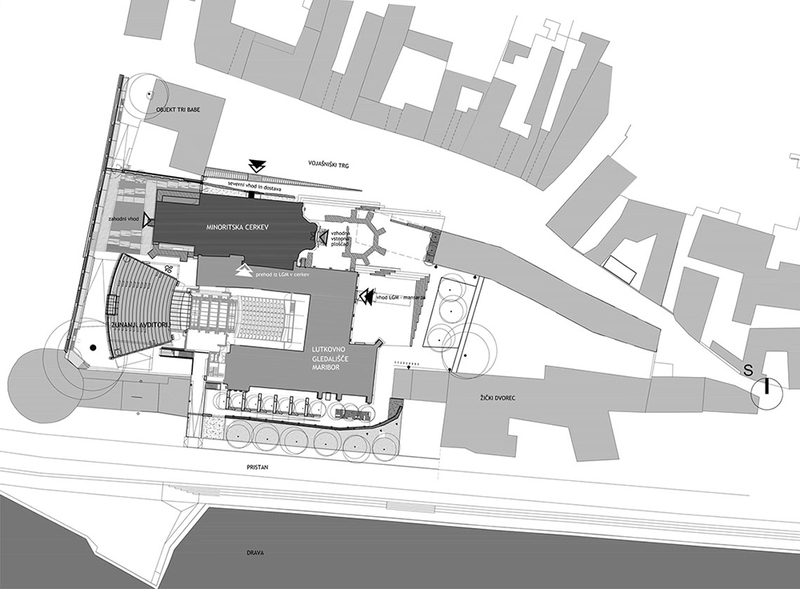 We are finishing the design for the library in Radovljica, which is always exciting. 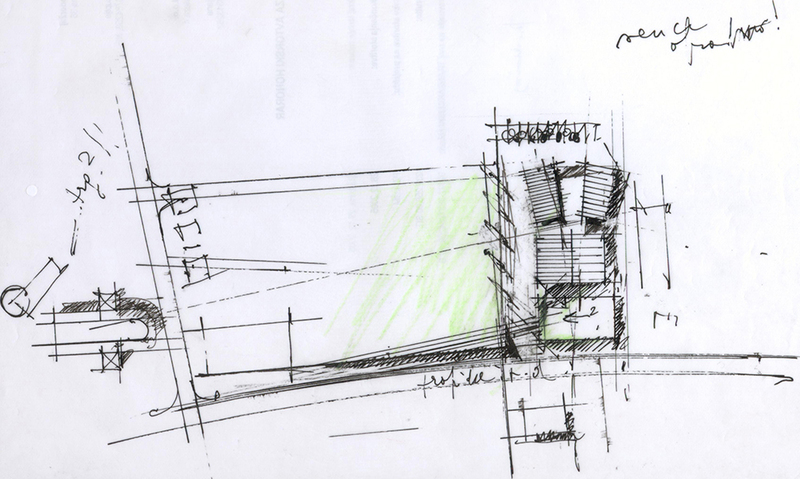 This is part of a broader project entitled Vurnik Square that we realised with Matjaž Pangerc. 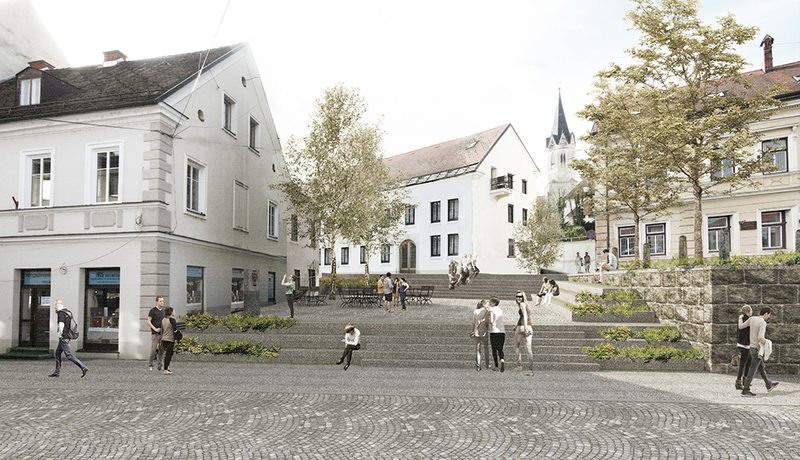 We are finishing the project of open spaces for the Novo Mesto city centre, where the already mentioned realisation has started. Moreover, I can hardly wait for the continuation of “the Minorites” in Maribor, while we are also preparing drafts for Trubarjeva Street in Ljubljana, as well as a small access to the Castle Hill there, and some smaller projects. With regard to sketches, in Oris I recently published a text entitled “On the Line Made with a Hand.” A line has the power to lead you. When making a line on a computer you have to know where you will end up, while with a line made by hand you don’t really know what your destination will be. A stroke made by hand is in constant touch with your head, which corrects the flow of your hand as if both are slightly ahead of any decision. In reality, a sketch is like a thought that’s much easier to control and correct, but it also teaches and leads you. By way of conclusion, I have a couple of questions related to painting. Your father, Boris Kobe, was an architect and a painter. Probably in your heart and soul you too feel like an artist. You had several painting exhibitions, the last that I remember was in 2011 in the atrium of the City Hall in Ljubljana, entitled Metamorphoses. 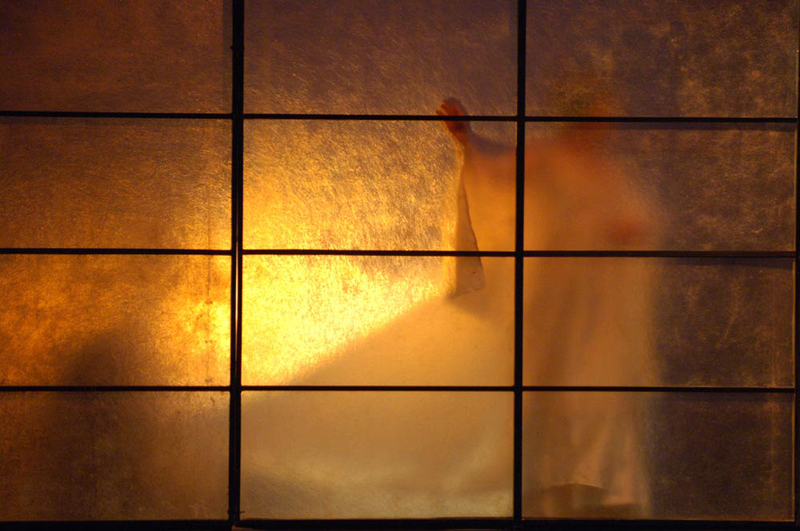 Your exhibitions reveal a more internal, intimate side of your creativity. Unfortunately, I experienced my father as an architect to a much lesser extent than through his painting. In those years when I started to look around myself a little, my father was recovering from a stroke, and that’s when he gave up architecture. I used my connections to get my driving licence when I was only 17, so I could drive my father around and go to his “painting” rehabilitation. I’ve liked to draw and paint ever since I was a child. Later on I didn’t do much of that, but given the situation, driving my father around, I had a chance to go through a nice painting course. 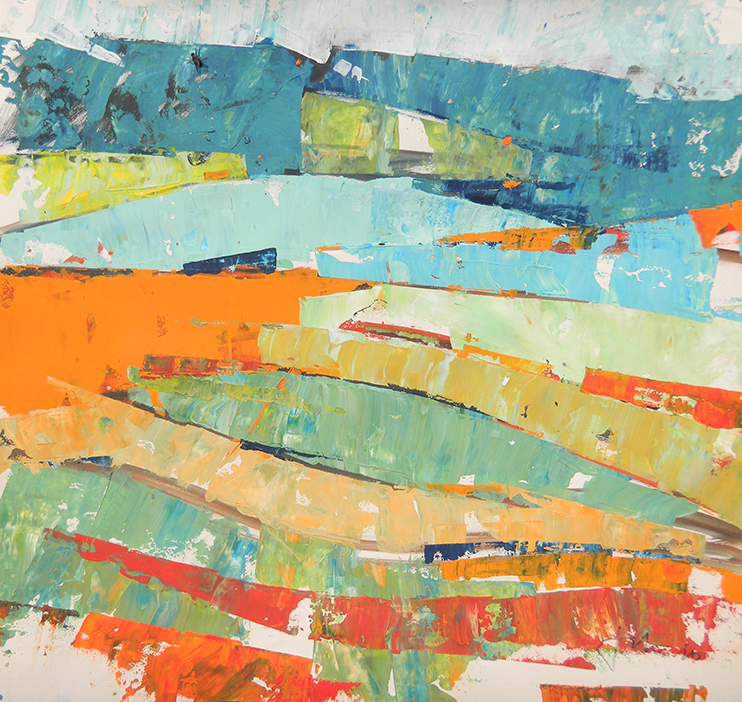 On a broader not, I’ve never differentiated between architecture and painting. The basics are similar. There is a narrative and a structure that you need to arrange and design. Similarly, you don’t only take account of the form, but also how it has been set up and who builds it. Only the result is faster, the first result only, of course, but that’s not immediately satisfactory. And no one bothers you around that, you don’t depend on the provider, investor … You are carrying everything with you! Eventually, you took over from Sergej Pavlin to teach colour studies at the Faculty of Architecture. You actually came to the faculty relatively late, and now you are coming to an end of your pedagogical work. What did you feel was the most important thing that you achieved with your students? I came to the faculty in 2002. I was appointed assistant professor already in 1996. 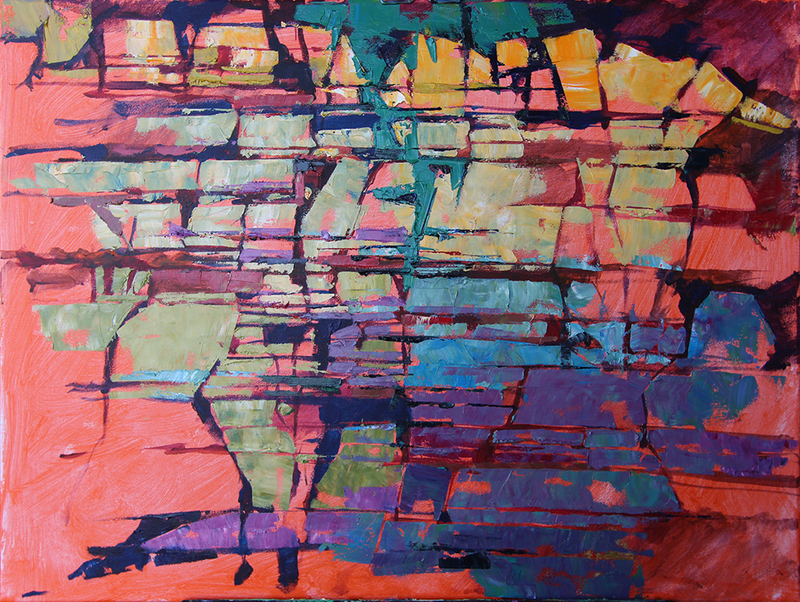 Peter (Gabrijelčič) called me to take over two subjects: Colour Studies and Interior Design. But I also designed a seminar which had a very high attendance, and subsequently took over the subject of Architectural Design. Formally, however, I’m now retired. In teaching I found it most important to create good foundations for any project, and above all not to focus on “how to do something,” but rather “why do it like that?” I wanted the students to think of as many reasons as possible, to spur their interest in a certain decision. I encouraged them to read diverse works of literature, listen to music, watch movies, observe. With this approach, of course, you get feedback from fewer students than when you teach them how to draw a plan. And I’m afraid that on average our schools focus too much on teaching drawing, without really thinking. © 2012 Piranesi. All Rights Reserved.